Sayonara Wild Hearts was a game I first discovered during the Kinda Funny Games Showcase back in December of 2018 and from there my heart was captured. Fast forward a few months later walking by the Annapurna Interactive booth at PAX East you couldn’t help but be drawn in by the large screen flashing vibrant scenes of dark purples and bright pinks coupled with pulsing pop synths that were shooting across the convention floor. 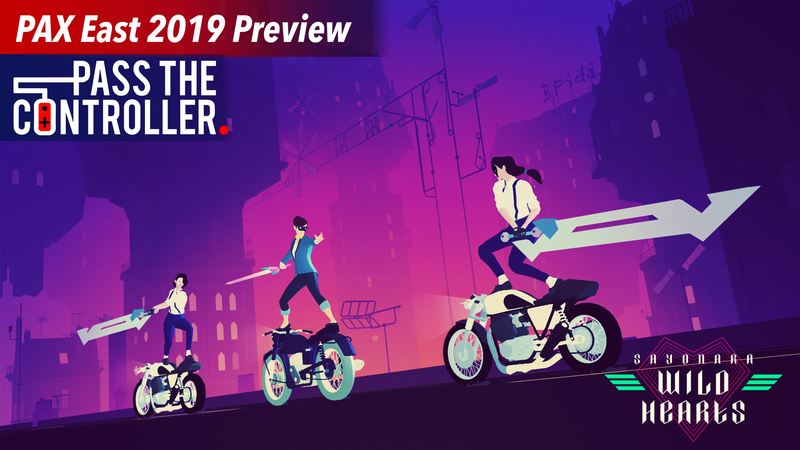 Sayonara Wild Hearts has the player in control of The Fool, a heartbroken woman, as she navigates the world through flight and on the back of motorcycles and skateboards as you traverse an eye-popping landscape backed by an original album of pop music. Swedish developer Simogo describes Sayonara as a “pop album video game” and that’s exactly the type of entertainment you are about to consume when you lose yourself in the dreamlike experience of playing this high-speed thrill of a rhythm game. I wouldn’t classify Sayonara Wild Hearts into one singular category or genre fully, but it is easily the most enjoyable on-rails video game that has ever existed. Some moments are full of quick decision making as you zip across cities and other fantastical locales at high speeds while collecting hearts to increase your score and dodge your enemies. While other times you are shooting, dodging, and fighting against your adversaries by timing your button presses. With a custom built soundtrack and level design to match, you find yourself fully immersed in visual and aural bliss. In the few stages that I did have the chance to play, I never felt a difficulty barrier that would keep people of all skill types away from being able to enjoy this playable album. It appears that for those seeking the true challenge it would lie in chasing high scores, which would lend to Sayonara Wild Hearts‘ high replay value– and of course because you want to experience the catchy tunes and addictive gameplay again. It’s hard to fully explain the art style and sound design of Sayonara Wild Hearts while giving it the proper praise it deserves. In some of the stages I played it felt like I was dipping my mind into a rainbow as I disappeared into a trance-like state of existence. Other times, the thumping in my chest was matching the tempo of the songs as I tried to collect every heart on screen while dodging cars and fireballs. Sayonara Wild Hearts is easily one of the most unique gaming experiences I’ve had this year, let alone just at PAX East. I’m looking forward to securing the best scores amongst my friends in this beautifully designed, anime-esque, musical adventure that oozes the style I wish I had and attitude of the game you wish you were making. Sayonara Wild Hearts launches later this year on Nintendo Switch with more platforms planned for the future. For all things Sayonara Wild Hearts and indie games keep it locked to Pass The Controller— and for a deeper dive on all things gaming and nerd culture be sure to listen to the Pass The Controller Podcast with new episodes weekly. Join our community Discord to keep the conversation going with us!